Jeff Ament of Pearl Jam performs at Barclays Center on October 18th, 2013 in Brooklyn, NY. There’s always been something of a divide between the worlds of sports and music. Musicians are supposed to be too precocious, slight and cardigan-prone to concern themselves with the pig-headed machismo of professional athletics. And athletes are supposed to be too dumb and aggressive to cultivate interests in such fey cultural nodes as, you know, expressions of feeling through song. But Pearl Jam bassist Jeff Ament is the bridge between this seemingly inexorable gap. He’s a hoops fanatic with considerable skills on the basketball court, two traits that make him a bit of an outlier amongst his rock & roll brethren – though, strangely, not his own band – and the perfect person for Rolling Stone to speak with as a brand-new NBA season begins. Earlier this month, we caught up with him to discuss the perils of fandom, Leonardo DiCaprio’s low-post game and playing pickup hoops with Arcade Fire’s Win Butler. Before the SuperSonics left Seattle in 2008, how huge of a fan were you? Huge. I had season tickets for 10 years. I lived about two blocks from the KeyArena at that time, so I was all the way in. I probably saw 35 games a year. And when they made those playoff runs in the ’90s I was at a lot of the away games. I sorta got into the inner circle of the Sonics a bit. I got to know Shawn [Kemp] pretty well and later got to know Frank Brickowski pretty well. So yeah, short of bleeding green-and-gold, I was in. [Laughs] Right. There was a poster company called Costacos Brothers and they did all the kind of “themed” player posters at that time. I was friends with John, one of the brothers. And Pearl Jam’s height was right when Shawn was sorta coming up in the league. I literally walked across the street to the arena, spent 10 minutes shooting photos one day and hung out with Shawn and they gave the posters away at a game later in the season. I was just stoked to be in the same room as an NBA guy, let alone Shawn. He was a first-team all-NBA guy at the time. Is he your favorite Sonic of all time? Yeah, he’d be right up there. My tickets were second row on the floor, underneath the baskets, so I witnessed some crazy athleticism from Shawn during that time. When they drafted Kevin Durant in 2007 were you excited, or did you already have a sense they were going to move away from Seattle? The Sonics moving really happened overnight. Like, they were sold and Clay Bennett immediately said “We’re gonna keep the team here, blah, blah” and within 4 or 5 months they were gone. That whole thing is a sore topic for anyone who’s really in the know. They kept using the arena [as a reason to move]. David Stern kept saying “the arena is the worst arena in the league.” I actually went on a couple of radio shows just to clear it up and say “I’ve played in all of these arenas and it is clearly not the worst in the league. It’s clearly middle-of-the-pack.” Places like Auburn Hills and the Target Center were worse than KeyArena was at that time. There’s a lot of arenas that are in worse shape today. I think it was political. I think a lot of it had to do with Oklahoma City sort of saving the New Orleans franchise after Katrina and you know, some back-room payoff. 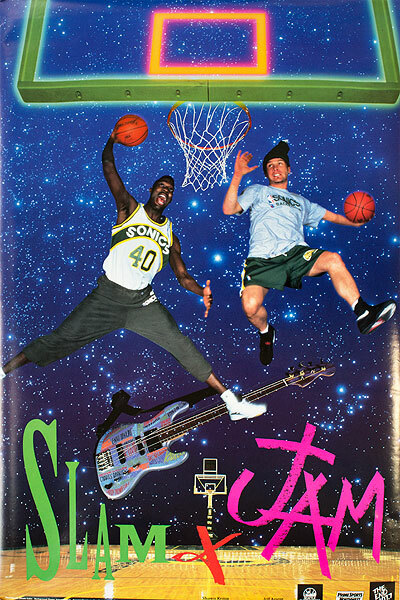 There’s a great documentary out there on the whole thing called Sonicsgate. The guys that made the movie have been vigilant about staying on top of the story. Last year, it looked like the Sacramento Kings were going to move to Seattle, but in the end, the city of Sacramento pulled off a last-minute deal to keep them. Would you have welcomed the Kings with open arms? I like the small-market teams, so I felt kind of bad for a bit. I went to some of those games when Chris Webber and those guys were there and ARCO is as exciting a crowd as I’d ever witnessed in the NBA. Just on that alone, you’d hate to see that go away. Smaller city crowds aren’t jaded, they’re giving it all they got. So I was feeling a little bad about it. But, I think they [Sacramento] got railroaded into a horrible deal. The deal that the city cut to get the arena built will bankrupt it. It’ll look good for Kevin [Johnson, mayor of Sacramento and former Phoenix Suns point guard] for now, but I think in 10 years it’ll end up looking bad. I read an article where they crunched the numbers on that deal and it’s a bad one financially for the city. They just don’t have the population, you know? That’s the thing that Seattle has: 2 million people. We could easily support a team. Steve Ballmer was the other big hope for basketball in Seattle. But now that he’s bought the Clippers, does it feel like the window for basketball in Seattle is closing? Maybe, but I know a few people who work for the NBA and they say in the next 4 to 5 years they think it’s gonna happen, either through expansion or getting another one of these teams that aren’t doing as well. Chris Hansen [billionaire hedge-fund manager] bought two city blocks downtown and within the next year wants to build an arena there and get a team. And I got 10 years of having a front-row seat for great basketball. The Jordan Era, the first few years of LeBron. I feel like I got three lifetimes of amazing basketball already, so I can’t complain. Since the Sonics moved to Oklahoma City and became the Thunder, do you still you root for them? You know, I do. And I take a lot of flak for it down at my local gym where I hoop. I knew they were gonna be good right away. I met Sam Presti before he moved from the Spurs to the Thunder and everybody was saying “Presti, he knows how to do it.” He came up under R.C. Buford with the Spurs and he knows how to draft, how to manage the team. I knew they would be good but not this fast. And they’re an exciting team to watch. Russell Westbrook is, you know, arguably the most explosive physical specimen that the NBA has ever had except for maybe early Jordan. He’s off the charts. If Pearl Jam were an NBA franchise, which one would they be? I don’t know. Maybe the Thunder, though we’re not really young anymore. In that way maybe we’re more like the Spurs. [Laughs] But we’re not as conservative as them, or as boring to watch. They get it done though. Have you met other musicians over the years who play basketball? There’s not as many as you’d think. I played in the first couple Rock N’ Jock games that MTV had and there were very few “rock” guys and only a handful of hip-hop guys that played. I have a picture of the first year I did it and it was like the Boyz II Men guys, 90210 guys, Marky Mark and a super-young Leonardo DiCaprio who looked like he was 12 years old in the picture, though I don’t know how old he really was. He got his man body in the last ten years, so he’s probably got a little bit of game now. Didn’t you break someone’s nose during one of those games? It was purely accidental. Win hooked up a game in Auckland, New Zealand and there was a bunch of college players playing. It was game point and there was a loose ball and I got to it first. And this big herkin’ New Zealand guy is standing over me, like 6’5″ and got 50 pounds on me, and he basically wouldn’t let me stand up. I sort of showed him that I was gonna stand up and pushed out my shoulders and elbows and he was just hovering over me. I stood straight up and the corner of my elbow clipped his nose and just snapped it, man. If you’re gonna get your nose broken in a basketball game, Jeff Ament is the guy to do it. That’s a good story for that guy.